Bella Vista, one of the finest hotels in Cobh, offers superior accommodation in the beautiful harbour town of Cobh, County Cork. This luxury cobh hotel is a Victorian villa, which has been completely and sensitively renovated to provide the perfect combination of modern comfort with traditional style and hospitality. Bella Vista majestically overlooks the picturesque heritage town of Queenstown Cobh and Cork Harbour. Here at Bella Vista Cobh Hotel, we pride ourselves on offering our guests a sense of homeliness in a refined yet friendly and professional environment. Each of our 18 en-suite guest rooms and 10 self catering suites are superbly furnished and individually decorated. Each room has its own individual character and décor and boasts satellite television and tea & coffee making facilities. We offer a laundry service and also provide a mailing, fax service and free internet access to all of our guests. Guests can avail of our free WIFI service with their own computers or can use our business center facility at no extra cost. Most of the rooms offer breathtaking panoramic views of the world's second largest cork natural harbour, where many cruise liners anchor ship and the ill-fated Titanic docked on its maiden, and final voyage. 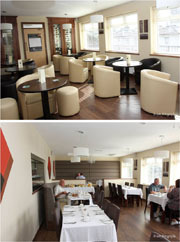 We also have a wonderful Chinese & European restaurant offering quality food at the right price. Serving untill 11:00pm nightly. Relax and watch television or read a paper in front of an open fire or enjoy a pint of Guinness or a glass of Irish whiskey in our full rustic bar. We are proud of being one of the finest hotels in cork. We are situated in a quiet area only a 3-minute walk from the picturesque town centre of queenstown cobh also pronounced as cove. Cobh and the East Cork region offer a range of activities for every taste - water sports, golfing, angling, walking & hiking trails, museums, theatre, cinema, concerts, Irish 'ceoil & craic' sessions, as well as a range of historical sites and the infamous Fota Wildlife Park. Cobh itself is a mere 20-minute drive from Cork City and 15 minutes by direct train link to Ireland's second largest city and 2005's European Capital of Culture. We are also only a 40-minute drive from two beautiful sandy Blue-Flag beaches and the well-known family activity centre of Trabolgan. Cobh is also a great portal to the rest of the East Cork region, West Cork, and to the surrounding counties. We are only a 1-hour drive from the breathtaking Mitchelstown Caves, 30 minute drive from the scenic seaside town of Kinsale, 1 hour and 15 minute from the beautiful Killarney region, and only 30 minutes from the infamous Blarney castle. We are situated on the doorstep of Carrigtwohill, Carrigaline, Little Island and Midleton, the attraction of the major business developement companies. The quiet and tasteful Bella Vista Cork Hotel is the ideal place for an intimate weekend or relaxing family break in East Cork, with excellent service and quality assured. Bellavista Hotel lets you choose between luxury hotel's rooms or self catering homes or quality budget guest house, the Harleys Guest House.